Basically, what’s suggested might happen later in this piece is what has actually happened for Wisconsin football in 2018. The defense has regressed given who it lost and the offense has improved to help keep things moving along. Originally published on July 6, here’s out Wisconsin preview from the summer with a little more context on how the season has actually started. 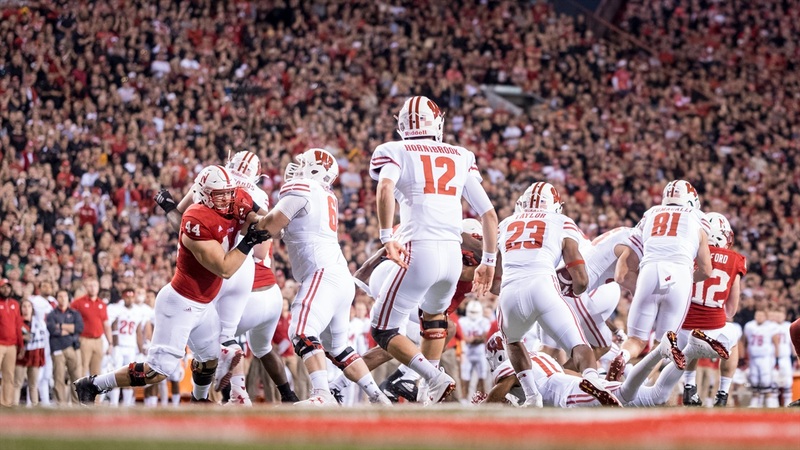 The Badgers lost to BYU 24-21 on Sept. 15 after Rafael Gaglianone (a fifth-year senior kicker with a career 79.7 percent conversion rate) shanked a game-tying field goal wide left with 36 seconds on the clock. So far that’s the only blemish. A preseason No. 5 ranking was probably a little overzealous for a team with Wisconsin’s profile coming into the season, but hey, how often are preseason rankings dead-on? The Badgers were looking at a 10-3 projection and through five weeks, FootballOutsiders.com has the projection at 9-3. So, they are who we (being nerdy statisticians and not pollsters) thought they were. Wisconsin’s season has been carried by the offense through four games. It’s been more lopsided than most probably thought it would be heading in, but the offense has been pretty good. The Badgers rank fourth in the Big Ten in total offense despite being a horribly inexplosive unit, because they rank fourth in the country in success rate (54.3 percent). Running back Jonathan Taylor is leading the nation in rushing at 157 yards a game and he’s doing it behind an offensive line that doesn’t get stuffed and hardly gets pushed around. Wisconsin is fourth in the country in stuff rate (just 9.9 percent of runs) and second in opportunity rate (when 5 yards are available, the offense gets 5 yards 61.1 percent of the time). They run on standard downs and throw on passing downs. They’re terrible about getting guys in space (125th in percentage of solo tackles) yet still move the ball. They’re not explosive but make you regret it when you bring pressure. Death by 1,000 papercuts, I guess. Quarterback Alex Hornibrook is up to 800 yards passing, six touchdowns against two picks and has a 66.7 percent completion rate through four. They’ve been as expected. Like I said, regression was expected but the Badger defense has just been weird. They’re 49th in S&P+ and 78th in success rate yet still boast the second-best scoring defense in the conference. The Badgers have only produced three sacks in four games and the defensive line has a havoc rate that ranks 115th nationally. Meanwhile, the secondary and the linebackers are up in the top-20. They rank in the 90s on third-and-short success rate but can run-stop with the best of them (10th in stuff rate). Then that same front can’t get after the quarterback when he drops back. They’re bad from their 30-yard-line to the 11 but have the second-best success rate inside the 10. If you’re good, you’re copied. If you stay good, it’s because you keep evolving. Wisconsin has been really good at what it does for a while now (there’s another Big Ten West school that could make the case “what it does” wasn’t even its own thing to begin with but that's a conversation for another time…) but that hasn’t stopped head coach Paul Chryst and company from pushing the envelope a bit on what exactly it is Wisconsin does. There’s a line in Bill Connelly’s Wisconsin team preview that’s just so great it has to be repeated. “UW has become impossible to elaborate on because it appears so easy to describe,” he wrote for SB Nation. Hammer, meet nail head. Wisconsin wears on you. Wisconsin grinds on you. Wisconsin beats you down in the trenches and then chews the entire second half without throwing a single pass because it doesn’t need to. Because the Badgers know and their opponent knows and Uncle Buck in the stands knows and Joel Klatt in the booth knows and you know and I know. It’s Wisconsin. That’s just what they do. A freshman running back ran for 1,977 yards last season, scored 13 touchdowns and averaged 6.6 yards a carry. The ground game as a whole ranked 40th in the nation in rushing yards per play, 24th in rushing S&P+ and 18th in adjusted line yards. Death, taxes, Wisconsin running it down folks’ throats. And on the other side, the defense was its usual bruising self. The Badgers didn’t let teams run the ball with any modicum of efficiency (26th in rushing yards per play), turned the secondary into a no-fly zone (third in passing yards per play; first in linebacker havoc rate and fourth in defensive back havoc rate) and prevented the chunk plays (sixth in yards per point). If the best defensive line in the conference resided in Columbus, the best linebacking crew in the country sat in Madison; the five main backers — Ryan Connelly (ILB), T.J. Edwards (ILB), Leon Jacobs (OLB), Andrew Van Ginkel (OLB) and Garret Dooley (OLB) — had nearly as many havoc plays as the entire Nebraska defense. Nebraska had 84 tackles for loss, passes defended and forced fumbles combined. Five Wisconsin linebackers had 81.5. Defensive coordinator Jim Leonhard’s first season calling the shots was an incredible success. Wisconsin held teams to an average of 4.64 yards a play on first down (fifth in the country) and teams couldn’t convert on third down consistently due to the distance. Offenses lucky enough to string a drive together then had to try and score in the red zone, where the Badgers had the best touchdown-preventing defense in the country, only allowing six points on 31.4 percent of trips. Just to make things a bit more succinct, here’s the most important (and in this case, all-encompassing) number: 247-74. That was the point differential in favor of the Wisconsin Badgers in the second half of all 14 games played in 2017. They lost one second half all season long and even that was by three points. There’s a 49-0 second half in there, a 16-0 half in there and a 31-7 second half in there. When Wisconsin plays Wisconsin football at the highest level, that’s what happens. But here’s the thing, the offensive approach is changing a bit in the last few seasons. A little bit. It’s not just about appeasing Run the Ball Guy anymore, the passing game has gone from, “Okay, just make the second-and-medium throw and keep us on schedule,” to “Guess what, here’s a 40-yard bomb you weren’t expecting.” Passing IsoPPP+ has gone from 106th in 2015 to 95th in 2016 and 62nd last season. With a pre-Chryst offense, that second half number might have been something like 147-74. Having an efficient and explosive passing game has made things even tougher on opponents. That trend is probably continuing into this season too, partially out of natural progression and partially out of necessity. As mentioned above, only four starters return from one of the best defenses in program history. Both ends are gone; that ain’t good in a 3-4 defense. Both starting corners are gone; also not good. Dooley and Jacobs are gone. Safety Natrell Jamerson is gone. Things will need to be rebuilt in the back half. It’s Wisconsin, so recent history suggests it will just plug a few former walk-ons into the equation and pump out a few more All-Americans and go on its merry way, but in this current Wisconsin football climate, it doesn’t need to. Alex Hornibrook has increased the margin for error. This defense can go from top-five to top-25 and things might honestly be fine. The Badgers were 23rd in the country in passing yards per play and 11th in explosive pass play percentage. Only one other quarterback in the conference had more interceptions than Hornibrook a season ago (guess who…) and that can’t happen again until Wisconsin figures out what it has on defense, but Hornibrook was just flat out more than a game manager. He took risks, yes, but also spearheaded an offense that’s improved across the board year over year since he took over. Wisconsin’s national ranking in both success rate and IsoPPP+ (an explosiveness metric) were the highest they have been since 2014. Over the last three seasons, the finishing ability (points per trip inside the 40s) has gone from 106th to 86th to 23rd. Hornibrook has lost his main target in tight end Troy Fumagalli (targeted on 24 percent of passes last season!) but his big-play threat Quintez Cephus (team-high 16.7 YPC) is back along with AJ Taylor (second-best 31 catches) and Danny Davis III (418 yards and five scores on 26 catches as a freshman). Obviously, Taylor comes back as well and the entire offensive line is still intact. Oh, and here’s another little fun fact: the Badger offense had the No. 1 third-down S&P+ rating in the country. So forcing third downs is normally cool but against Wisconsin it did nothing. Taylor averaged NINE POINT TWO yards per carry on third downs and Hornibrook had a better quarterback rating on third than he did on first. Again, they only lost a tight end and a fullback — two positions that are relatively less painful to replace. This offense could and probably should be even better next season. They once again played for the Big Ten title last go-around and had a chance at the College Football Playoff. The defensive departures have lowered the expectations a bit heading into 2018, but not by much. ESPN’s FPI predicts the Badgers to finish 10-3 with a strength of schedule that ranks 64th in the nation. Iowa, Michigan, Northwestern, Penn State and Purdue make up the road schedule. There are no gimmies. The Badgers haven’t beaten the Nittany Lions on the road since 2003; they’re 2-5 in their last seven overall meetings as well. They’re 1-4 in their last five against Northwestern on the road. But as we’ve seen since Chryst took over, this might be a new-breed Wisconsin team.